Zagra is a picturesque white washed village nestled in the hills, an hours drive away from the beautiful city of Granada. The tiny village feels like the ‘real Spain’, truly unspoilt by tourism. 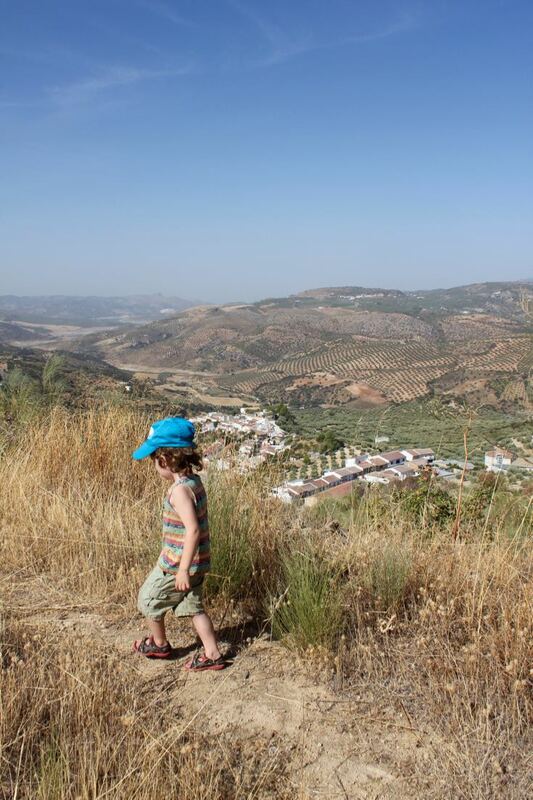 The village is dominated by a large hill, which the Moorish castle sits on top of and is entirely surrounded by endless rows and rows of olive trees, as far as the eye can see. The path up to the castle zig zags past the local villager’s tiny houses, which have quirky separate kitchens on the other side of the path! Chaos has become fascinated with knights recently, luckily we have moved to the Granada province which has a multitude of castles. Most of the castles in this region of Granada were built as the first line of defence to protect the Nastrid kingdom in Spain, the last Muslim dynasty, from the Christians. So they were’t exactly the traditional home of knights but, we kept that one quiet whilst a very excited Chaos (apart from when he skidded and fell over, whoops) climbed up the mountainside to visit Zagra Castle. The friendly villagers warned us that the ‘camino era malo’, the ‘path was bad’, it wasn’t the greatest, certainly not the landscaped paths that we have become used to in more touristic places, it was rustic to say the least. Zagra castle felt refreshingly part of the landscape and environment, insofar as it was neither well preserved nor well maintained. It was there, had been there for ages and blended in. The locals seemed to have taken the castle as their own, fixed their sheds and allotments to the crumbling castle walls, planted their vegetables alongside the paths and absorbed the crumbling castle into their lives and environment. Chaos isn’t really a walker, at three and a half he’s only just really started walking around instead of wanting to be carried everywhere, like his little brother Mayhem. So, it took a little bit of persuasion to coax him to walk for the twenty minutes or so, up to the top of the hill. With a few renditions of the Grand Old Duke of York and promise of a tasty picnic, we made it to the top to have lunch with a view and explore the ruined castle. The boys loved running around the old ruin in the knee-high grass, searching for the knights and playing hide and seek. We never did catch a glimpse of those elusive knights but the boys had a brilliant time trying. If you’re ever in the Pontevedra region, I’m sure you’d all love Castelo de Soutomaior. It must be one of best preserved I have been to 🙂 And the gardens there are just stunning too! Thanks, We will check it out. The boys seem to love castles and gardens!